Zambia : Zambia’s hidden debt crisis: the real debt is $30 Billion! Home Headlines Zambia’s hidden debt crisis: the real debt is $30 Billion! On 21st June 2017, Finance Minister Felix Mutati gave a ministerial statement in Parliament in which he said that Zambia’s foreign debt stock stood at $17.2 billion. After much debate and discussion, he clarified later on that he had misspoken and that the correct figure was actually $7.2 billion. This figure was challenged, most notably by Mr Trevor Simumba, a Zambian financial analyst. Considering that there is much confusion among Zambians on what the correct debt position is, we did our own research and concluded that the figure of $7.2 billion Mr Mutati gave is simply not true. Based on evidence gathered from a variety of sources, we have found that the true figure appears to be at least 4 times larger than stated. Our preliminary figures, based on information in the public domain, show that at a minimum, the true debt position is about $30 billion!!! In 2011 when the Patriotic Front (PF) government took office, Zambia’s external debt stood at $3.5 billion (15% of GDP). Using the government’s own figures, it has ballooned to $7.2 billion (34% of an estimated $21 billion GDP) in 2017 and the year is not yet over. But the World Bank as of 2015 put the debt at $8.7 billion (by 2017 it is certainly around $10 billion). Using our computed figure of $33 billion, it is 157% of GDP. 40% is the government’s own acceptable threshold. The list below, which is certainly not exhaustive, does not count other loans for 2017 still in negotiations such as the Lusaka-Ndola dual carriageway which will cost not less than $500 million and it does not factor in local debt ($4 billion) or arrears owed to contractors ($1.7 billion). We have also not factored in an estimate of unknown loans. We estimate that the grand total of all debts is anything from $35 billion to $40 billion. To make our research more complete, we have also taken into account debt servicing. Below the list of loans is the list of debt servicing per year from 2011 to 2015 based on data from the World Bank. We have added our own estimate for debt servicing for 2016 and 2017. Also of note is the fact that the government has this year requested for an additional $8 billion from China to fund infrastructure development! This shall make the debt position far worse than anything imaginable for Zambia. What is clear from all the information available is that Zambia is sitting on a massive debt time bomb that shall explode in a very big way within the next 5 to 10 years. Based on projections of current economic growth rates, Zambia will not manage to pay off those debts in a sustainable way. A sovereign debt default and significant credit rating downgrade is a very real possibility. We do not claim perfection in our research and there is a chance that there could be gaps in our information. We, therefore, call upon Mr Mutati to issue another ministerial statement and shed light on this matter with the true debt position because it appears the Zambian government is being economical with the truth. Zambians need to know the real debt position so that they can anticipate what is coming ahead of us economically. The IMF is already in negotiations with the government for a $1.6 billion bailout and they also need to know the truth, the whole truth and nothing but the truth to determine how much they can lend because they need to know our capacity to repay. Is it $30 billion or K30 billion? How come even the international lenders confirmed Mr. Mutati’s figure of $7.2 million? Why is Mr. Mutati hiding as if he is the one to pay? Ok even if it is $50 million the government of Zambia will pay (you, me and others) so please stop alarming us by cooking numbers, sure from 7 to 30 nishi tatulipilako? People were dancing when we warned that the whole PF project was a totally mistake Zambians will live to regret. Has money for all these projects been borrowed yet? E.g chipata rail line? Why does the Lusaka times get so excited? And Nevers wanted to be president. very linear thinking. IMF knows the real numbers govt cant hide. What about the Loan Zambia signed on behalf of Zimbabwe as guarantor, has it been included to the list? Right there, right that statement. I give up and can’t read anymore. It’s like they have picked up a wrong scent on something they’re following. WHAT IS THE SIGNIFICANCE OF NERVOUS NEVERS’ LEAKS? DOTORO MUMBA kindly verify your your sources. So now you’re even doubting figures from the Line ministry? When you say, “Miscellaneous small loans” you completely specifically being speculative. At your time, your Government, MMD borrowed for the pocket. PF is borrowing for the projects you’ve outlined. That said, what are you insinuating? I leave it up to the Minister to clarify. I hate it when minister lie. Are you scared of PF’s infrastructure development programs? Are they creating cause to easily scoop 2021 polls. Sonta epowabomba. Where is that daydreamer BR Mumba Sr.? Mumba has done his homework as a responsible Zambian, and has given you what he thinks are the facts including the source. If you people are intelligent enough, why dont you analyze before you come up to a conclusion. Many of you are just thick headed, all you can do is to brash off what Mumba is saying, simply because its not the taste of your tune. Take a step back before you criticize. His list contain real projects, are you saying this list is not correct? What is your argument to suggest that Mumba`s contribution is rubbish? Many of you people are hopeless, no wonder you are just followers without an opinion. You got your PHD`s from the same school as Mushota, no wonder. Muzanya na nkongole za kaloba. So PF can’t do anything without having to borrow money. It’s the people of Zambia who will pay for this through HIGH TAXATION. The correct position of th debt should be established. The other question to ask is, where has this money gone? $20.000.000.000 poverty reduction, thats about $1300 per Zambian, anyone seen it? So, Pastor Mumba is convinced with your figures that Government contracted loans of $6.7 billion and $13.5 billion in 2011 and 2012 respectively? Which lending houses can provide such loans to a country like Zambia in a year? Please let’s be careful with speculative figures, and the culture of causing false alarm. 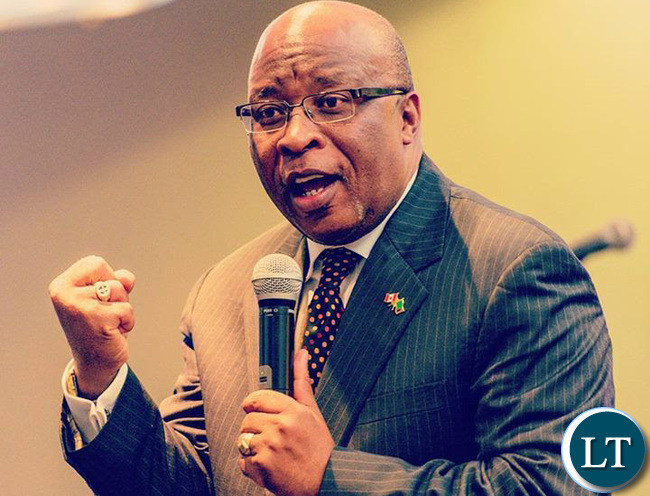 Unless this is true – under the TSOE, I think it is fair to visit people like Pastor Mumba. Can we have a break down of the Poverty Reduction programs for 2012 and 2013? Most of the figures are know =n but these two? I wonder why protestants pastors always talk about money? People who go to these “saved” churches tabakwata mano. Over to you Mr Mutati. This is good Dr Mumba. That is what it means to be in opposition, present your arguments with facts and watch as they try to wiggle out of them. This is bad economic arithmetic! Where do you chaps convene to plot pander! We need new brooms or we are doomed! Well, these figures are just an imagination. Just a quick verification shows a lot of discrepancies. Opening the sources cited does not add up to that amount. Then some figures are quoted in Zambian Kwacha, so what exchange rate do you use to determine the USD equivalent? Then some figures are clearly stated to be grants. Also, banks are the most informed about default risk. If the bank lends you money, they are confident you are going to pay back, otherwise they would not do it. So do not think the institutions lending the Zambian government money do not have the information that you just searched on google. Bankers just collect a commission on deals, then sell on the debt if they think it is bad. Yes you are right, you can sell a debt to minimise a loss. You don’t sell a debt at a profit, because debts that are sold are bad debts. Owners have already defaulted or are about to. Banks don’t lend money with the hope of selling the debt, that comes as a last option. Instead of losing all the money, you would rather recover some by selling the debt. Bankers don’t own the money they are lending out , they earn a commission on the deals they generate…..check the giving of mortgages by banks and other lenders in the UK that lead to the current just gone crisis…. Euro you are not making sense. The figures do all add up. If you had more sense, you would easily check the exchange rate of the Kwacha in those years where Kwacha amounts are indicated in the source articles. eg it was K5 in 2012. Don’t be a lazy bum. i really like such reasoning .A seasoned approach to criticism backed by figures as well as sources of information .A lot of bloggers who come out as so knowledgeable can learn from this .Thanks so much for the information and well done . No. 2 and 3-$30bn for poverty reduction??? That is over 20 annual budgets, having such amounts in our economy would send the exchange rate to almost 1 to 1 with the dollar!!!! How come the owners of these unannounced debts didn’t own up when the minister addressed parliament??? What’s is this article about? And is lost shepherd Mumba the author? Just challenge the figures , they have even given sources……what are you hiding ?? Ba Spaka you talk of sources? But only the other day you’re disputing the authenticity of that article that praised the Zambian economy. Be like Jay Jay…tell it as it’s not because you belong to some party. I travel to Zambia regularly and can see the hardships and drop in living standards…..completly disconnected from those low inflation, good Marco economics ……blah blah blah…..the proff is in the living standards of the people. What is the use of all those good fundamentals when people are struggling to get by ?? Which Zambia do you travel to if you think the poverty just dropped like rain? The situation has just been growing gradually due to our dependence on good old copper. Just explain if any previous government has ever tried to seriously diversefy our economy. Zero. We’re like a yo-yo and meanwhile the population is out spacing the few jobs Welensky left us. Expecting government to rescue is just a fantasynchronous just as promising jobs and free education. continued from 11,13,..19) $94mn, Heroes Stadium, this was already covered by MMD how did PF borrow again for the same project? 21)$449Mn Kafulafuta Dam Water Project, what so or dam is this which is costing almost the same a medium sized hydro eclectric power station, dam and machinery included? 22) $275Mn Housing for Security Wings where and how is this different from No.13 2,000 Military Houses at $157Mn? 23) $600Mn, International Development Assistance(Association?) Programme (IDA), there is also IDA a borrowing window for World Bank that gives loans , but then what was the money used for? THESE ARE SOME THE ISSUES THE OPPOSITION AND CIVIC ORGANIZATION SHOULD HAVE BEEN CHALLENGING THOSE ON POWER ON!! iwe ka munba wat is wrong with you, is it your money or you think that you are the one to pay those debt? The ONLY WAY WE SHALL KNOW THE TRUTH IS FOR GOVERNMENT TO COME CLEAN WITH ITS OWN DETAILED FIGURES THAT WILL SHOW OTHERWISE. THAT IS POSSIBLE as the figures from Dr.Mumba, could have included some double counting too!! The problem we have is that funds are misallocated; hence, the growth of the economy is be slowed. As a result the misallocation of funds is working to the detriment of society. We need to efficiently allocate resources in order to optimal growth. One of the examples is why Build a State House when you can invest the money is project that will stimulate the economy. The problem we have is that Leaders are interested obtaining satisfaction of their highest levels of personal wants and not what the society needs. Fine. $30 billion or some sort whats the fuss? I thought we should be articulately looking at accountability here. not the Who, Where, When and How cliche’ should be applied. We don’t need alarmists here. Secondly, even if that Mumba list is cut by half, still the a question , why Muntati did not report the actual figures instead of what he presented. You talk of accountability? But that is the point Mumba is trying to raise, here he want accountability of that unreported money/debts, etc. This is the price you pay for voting for incompetent leaders whose prime goal is to line their pockets. Mr. Mutati knows the truth. There is no way he could have misread that $17 billion dollars in Parliament, not at that level!!! We are in trouble!! Mozambique managed to hide some $1.3bn debt . I think the $20 billion debt figure is more realistic if one adds all the announced borrowings that have been published…. Some of those project figures are bring done by our money (not borrowed) e.g from the toll gate and other projects, so Mr. Mumba has totaled all the projects figures even the ones which were borrowed before PF and heaped it on PF. any way why should the Finance Minister liar. actually all those figures a have been announced by the government for us to know how much they are spending on each project. Mr. Mumba shouldn’t show to be cleaver when not. the government has got a lot of resources where money is raised from. The source articles mention Sata signing for some of the big amounts so what are you talking about? Lazy bum who didn’t read but rushing to comment. I new PF was a PONZI SCHEME . You can see from the way they have cooked up inflation figures. The President Mr Edgar Beers Lungu is working hard to bring development. Development can only come to Zambia at a huge cost. This is the price we pay for being africans. When our debts are too huge to sustain the imperialists will come and rescue us. All is well in the end. So in reality every Zambian owes these Int’l lenders some $1875 …all this while the economy is growing at a snail pace of just 3% . This means poverty in the headlights coming to you at high speed. Loafers like Never Mumba, who have 24 and half hours to spend on social media can make even a normal citizen confused. Some of the projects such as Kafue Gorge have not yet taken off because funding has not been secured. THAT MONEY WAS BORROWED TO MAKE OUR LIVES BETTER. SO WHAT IS YOUR PROBLEM NEVERS MUMBA? WE WILL PAY USING OUR TAXES. INFACT THE GOVERNMENT SHOULD BORROW MORE AND REHABILITATE OUR ROADS. Why is Mutati not telling you the truth then? What is behind those lies, why is he hiding to say the real debt? Mumba`s point is not that the government borrowed, but the point is that the government through Mutati is not telling you the truth, and you deserve to know the truth. Country men and Women please don’t ignore these figures, they are matching up…we are dealing with the uneducated PF government who thinks they will hide the true figures from the Zambian people but this will just hurt everyone in the end…and some damn people are insulting MR. Mumba already for helping us understand….this just confirms the thinking capacity of most Zambian’s….I would take this seriously. @Chisanga revisit your post again: looking at the flag on your profile it looks like you are in Zambia: my question for you is straight forward and simple, is your life better right now since PF received the loans? My dear brother use your brain….you don’t use borrowed money to build roads it’s like borrowing money to by a suit ..smart people borrow money to invest it and make some profit on it…to service the loan….please open your little eyes…that place is doomed mark my words…. Is his life better under PF? Depends on what he does. This makes me really angry….reckless foooools!! Article does not mention Nevers as the source, just mentions WE. Who is we? As usual, chappy reporting by LT. Why put a picture of some loser and nothing referring to the loser in the article? Mutati’s alleged claims of $17.2 Billion (17,200,000,000 USD) or $7.2Billion (7,200,000,000.00 USD) muchitonga ni = K153.4 Billion(K153,345,787,287.96) oro K64.21 Billion (K64,206,755,494.56) respectively. Now these are the ones that folds folks, not the ones which jingles! So what? O! He thinks he can reduce that! No, Sir! It can’t go down when it is put in personal pockets! God bless you man of God and kindly return to the pulpit! Zambia shall be Saved! UPND is a spirit – an evil spirit! Anyone who follows it is blind! I pray against this spirit in the name of Jesus! I bind its divisive power, its rebellious power, its tribal power, its delusional power and its failure to learn or appreciate progress being made by the leaders in JESUS’ NAME! I rebuke you spirit of confusion and I cast you out in Jesus’ name! The same spirit at work in divisive political world that has visited many African countries I command you to get out of Zambia and bowel down to Jesus, in the name of the LORD! You will not succeed because Zambia is under the Almighty God and in God we trust! Thank you JESUS! @JJ you have always been angry (like all your your tribesmen who lost), you seem to be confessing who you actually are and not others who are sane! Mr Mumba, go an earn a real PhD preferably in Finance or Economics then you will know what to talk about. Do you even know our GDP? 1. But you just said that you git your figures fron tge public domain, so doesnt the IMF and World Bank have acess to the same figures? Or you think that you are geniuses? 2. With such “frightening” figures, can UPNDonkeys please tell me why he still wants to be President? If the answer is that “he can fix it” then we can also fix it. Look here UPNDonkeys, the majority of Zambians simply dont feel comfortable with ypur underfive and probably dont like his face too. They have told you this many times, and nothing will ever change. We told you last year that the sooner you look for a more viable replacement the better will be your electoral fortunes. Losses and petitions will not take you anywhere, but accepting the simple truth will. The article is not about Nevers. It’s about a little men rakeless borrowing. ADD ANOTHER $5 BILLION FOR EUROBONDS. @41, obviuosly the IMF Directors are daft, maybe you will be appointed to supervise them. Why not research world lending organizations or reputable independent statistics sources. You quoting stories from Lusakatimes.com? With due respect, how many blunders have we seen reported here. Has DR Mumba ever written a Thesis quoting mere internet sources as authentic authorities for basing his argument on? Maybe not even a Thesis, perhaps just a peer-reviewed article … can this stand scrutiny of even a casual kind? Dr Mushota what say you? Why not look at all the sources listed instead of focusing on LT sources? Don’t be a lazy bum. Read. Is Reuters not reliable? We appreciate the homework Nevers Mumba has revealed to the nation. This could not come from the sitting government. We also appreciate other positive comments to affirm what Mumba has revealed. However, those who dispute these alarming numbers should compute their reports and evidence for us to make meaningful truths. As of now Mumba figures are correct the PF government should humbly agree with him. Okay did you use BA Practical theology to come up with this figure. You quote a verse and expand it. Compute your figures and cite your sources to counter what Mumba has presented. We will respect you. – What is the actual debt to date? I am sure all the normal learned people can collate this data. – Do we have to borrow for most projects/programmes? What do we use our own generated resources for? – Can we account for exactly how all this money has been used? On another note, it is interesting that the Pakistani Prime Minister has been forced to resign on corruption shrouded issues – failing to account for what he and his family have amassed. The courts were involved in pursuing the matter. How l could loved the minister Mr. Felix mutati to clear the air on this issue as some of us commenting are just making political comments. By the way a normal human being should not drag UPND party in this issue because this challenge has been given by MMD president who happens to be Mr. Nervous Sakwila Mumba himself. Very true! As Julius Malema has wisely said, Africa risks being recolonized by China this time which may prove to be far worse than what we had with the British. Ba PF, you have auctioned this country through your reckless borrowing. Like Esau, Zambia has sold its sovereignty through the trap of debt. The borrower is a slave to the lender! Time to think of plan B at Micro level. There’s no hope in the failed project called Zambia! What a Pity! Analyse content presented instead of a attacking the presenter. What Nevers is saying has some significant truth in it. Why not do your investigation and critique? M0r0ns!! Our national budget is between $1.5bn and $1.8bn. Our GDP is $23.1bn. Which international lender would give a country a $30bn debt (as Nevers puts in 1 and 2) for poverty reduction with such figures????. It’s like a bank giving a company that generates annual profit of $55,000 and assets worth $150,000 a loan of $500,000-it’s just not feasible!!! Sometimes you need to just use your brain more to decipher rubbish from failed leaders like Nevers. $30bn are loans contracted by European or America or South Korea or Japan, not African countries. You live in a developed country yet you can’t read between the lines in such matters and can you can easily be duped by useless politicians like Nevers Mumba??? Analyse content presented instead of attacking the presenter. What Nevers is saying has some significant truth in it. Why not do your investigation and critique? M0r0ns!! Our national budget is between $1.5bn and $1.8bn. Our GDP is $23.1bn. Which international lender would give a country a $30bn debt (as Nevers puts in 1 and 2) for poverty reduction with such figures????. It’s like a bank giving a company that generates annual profit of $55,000 and assets worth $150,000 a loan of $500,000-it’s just not feasible!!! Sometimes you need to just use your brain more to decipher rubbish from failed leaders like Nevers. $30bn are loans contracted by European or America or South Korea or Japan, not African countries. You live in a developed country yet you can’t read between the lines in such matters and can you can easily be fooled by useless politicians like Nevers Mumba??? Who’s the real m0r0n??? Ba mumba go back to church. The proliferation of these Debt Stock figures means that there wont be any loan from IMF any time soon and until a Debt Sustainability Assessment is done by a Forensic Audit Firm.It would be highly irresponsible for IMF to approve a Loan to Zambia without first of all determining Zambia’s capacity to repay the New and Old Loans. Besides the IMF Board will not lend to Zambia with HH in Jail, current breakdown in the Rule of Law, poor Governance and lack of Respect for Constitutionalism. Mutati is doomed on this one! This government is useless every project that has been done is out. But the bad part is not all this money go to the intended purpose, the money go in to pocket of Edgar lungu and his minions! Shame! Demons will never be grateful for any positive thing. They see things differently. Tribe first, then projects! Ok you talking about the man above? He is a friend of the loser! Can some one term Kambwili, he is putting the governments name into disrepute, there by undermining the integrity of the Nation to the international community. Arrest him if he has a case to answer.